Promo duration is from February 1 to April 30, 2019. This promo is open to all Cebuana Lhuillier Pawnshop branches nationwide. 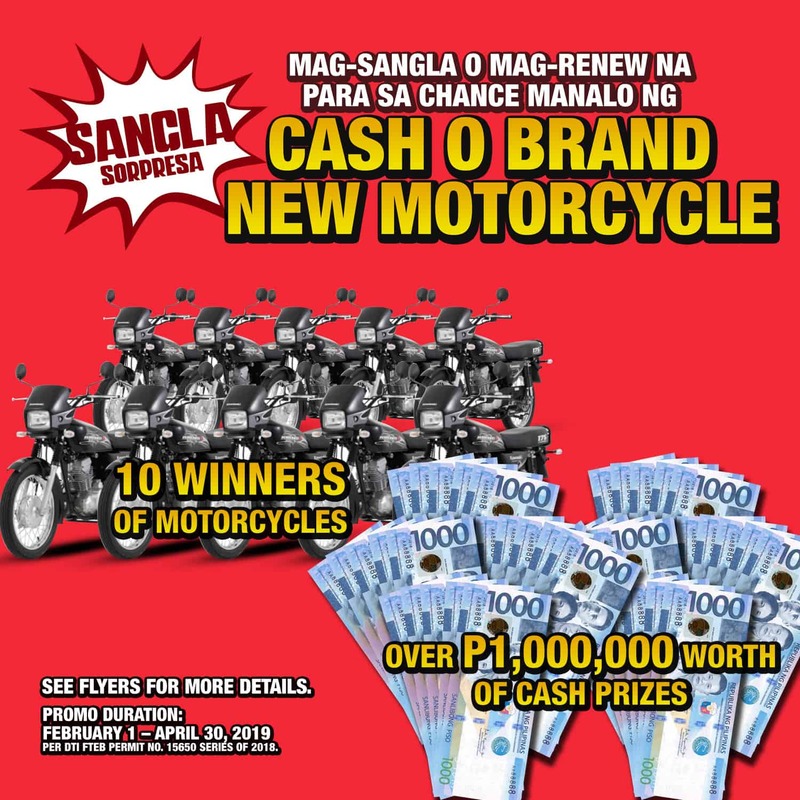 Each client who will have new pawning or renewal transaction will earn e-raffle entries depending on the principal amount. Clients with Cebuana Lhuillier Microsavings account will get additional 2 e-raffle entries. Non-cash prizes are not convertible to cash. A participant may only win once. If a name is drawn more than once, the winner will get the prize with higher value. Winners will be announced on branch and thru digital platforms. Draw date is on May 13, 2019, 4:00 pm, Monday at P.J Lhuillier, Inc. ICT Office 3/F, The Networld Hub 156 Jupiter cor., Bel-Air, Makati City 1209. This will be done with the presence of DTI representative. P. J. Lhuillier Inc. will pay the 20% tax for the prizes exceeding Php10,000. The registration and other expense related to the motorcycle prize shall be shouldered by the winner. Unclaimed prize within 60 days upon receipt of notification will be forfeited upon the approval of DTI in favour of Cebuana Lhuillier. Employees of P.J. Lhuillier Group of Companies, agencies and services and their relatives up to second degree of consanguinity or affinity are not qualified to join the e-raffle.